Our thick, printed and plain colour bench cushions are designed to make lounging outside comfortable and stylish. Choose from four printed designs and four plain colour bench cushions, all available in two different sizes. The Technicolour Stripe Bench Cushion features a vivid printed design of multi-coloured stripes, with a lime coloured base and trim around the sides. The Technicolour Geometric Bench Cushion features a bold, multi-coloured printed design, with a red coloured base and trim around the sides. The Sketched Roses Bench Cushion features hand-drawn black roses, with leaves, stems and thorns on a stone coloured background. The cushion has a plain stone coloured base and trim around the sides. The Pavilion Stripe Bench Cushion features a classic green, lime, stone and white striped print, with matching green on the reverse and around the sides. 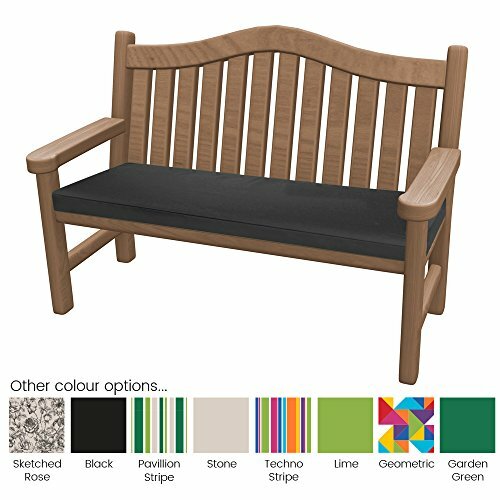 You can also choose from the four plain colour bench seat cushions in black, stone, green or lime. All of the bench cushions are made in 100% Water Resistant fabric and are filled with a thick hollowfibre pad. Add some scatter cushions to your bench with the coordinating printed designs and plain colour cushions, which can be found in PEBBLE’s brand range. Look out for the Technicolour Outdoor Cushion Collection and the Brits Outdoor Cushion Collection to match cushions with the above bench cushions. TWO SIZES – Small: 108x45x5cm or Large: 128x50x5cm – high quality, zipped cushions made in wipe-clean, 100% Water Resistant fabric. Choose from the Technicolour Stripe, Technicolour Geometric, Sketched Roses or Pavilion Stripe printed designs as well as plain colour options of black, stone, lime or green. Featuring two ties to secure the cushion to the back of the bench.